The vineyards of Chateau La Tour Haut Brion were planted for the first time in the 16th century by the Rostaing family. At the time, the estate was known as La Tour de Rostaing. The property was also called La Tour d’Esquivens. By the mid nineteenth century, the wines were only sold under the name of Chateau La Tour Haut Brion. In 1890, Chateau La Tour Haut Brion was sold and became became the property of Victor Coustau. Prior to the purchase of La Tour Haut Brion by the Coustau family, the wine was made at the chateau for La Tour Haut Brion. In about 1900, Victor Coustau purchased a neighboring, Pessac Leognan estate, Chateau La Mission Haut Brion. After the purchase, it was decided that the wines of Chateau La Tour Haut Brion from that point forward would be produced in the cellars of La Mission Haut Brion. Victor Coustau passed away in 1924. From there, Chateau La Tour Haut Brion was sold to the Woltner family. The Woltner’s of course knew the property well, as they already owned Chateau la Mission Haut-Brion. 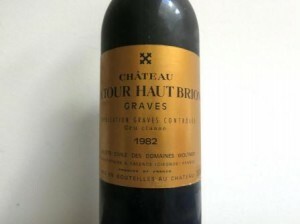 When the wines of the Graves appellation were classified: 1959 Classification of the Graves region, Chateau La Tour Haut Brion was the smallest of all the vineyards included in the classification. Chateau La Tour Haut Brion remained the property of the Woltner family for close to six decades, until they eventually sold the vineyard to the owners of Chateau Haut Brion. The 5 hectare vineyard of Chateau La Tour Haut Brion was planted to 42% Cabernet Sauvignon, 35% Merlot and 3% Cabernet Franc. The terroir consisted of deep, gravel based soils. On average, the wine was aged in 30% new, French oak barrels for between 18 and 22 months. Production was small. It hovered around 2,000 cases of Bordeaux wine in an average vintage. The wines were vinified at Chateau La Mission Haut Brion and received the same care and treatment as the wines of Chateau La Mission Haut Brion. The same technical team was in charge of both estates, in the vineyards, and in the wine cellars. Prior to 1983, Chateau La Tour Haut Brion was considered the second wine of Chateau La Mission Haut Brion by some people, but that is not the case, for at least most of its life. Keep in mind, the estate was part of the classification of 1959, and second wines could not be classified. But for a period of time, in some ways, it could have been considered a second wine by consumers. If that is the case, that is truly amazing when you consider how good these wines were. 1982 La Tour Haut Brion remains a sublime Bordeaux wine and one of the top wines ever produced by this chateau. Other older vintages are of equal, high quality. The 1961 Chateau La Tour Haut Brion remains a legend. I’d like to try a bottle one day. It’s certainly on my bucket list! The Woltner family sold La Tour Haut Brion in 1983 to the owners of Chateau Haut Brion, Clarence Dillon. After 1983, the wine was no longer considered as the second wine of La Mission Haut Brion. It was produced and sold on its own merits. Today, Chateau La Tour Haut Brion no longer exists. It was merged into Chateau La Mission Haut Brion in 2006. The final vintage from Chateau La Tour Haut Brion took place in 2005. The best vintages of Chateau La Tour Haut Brion are: 2018, 2017, 2000, 1982, 1978, 1961, 1959, 1955 and 1945. Other, older vintages could be worth taking a chance on at auction, if the wines are in good condition with provenance, as La Tour Haut Brion is powerful, tannic, concentrated wine, made to age and develop. This allows the wine to soften and open its perfume. Older vintages might need very little decanting, just enough to remove the sediment. Chateau La Tour Haut Brion offers its best drinking and should reach peak maturity between 15-50 years of age after the vintage. Chateau La Tour Haut Brion is best served at 15.5 degrees Celsius, 60 degrees Fahrenheit. The cool, almost cellar temperature gives the wine more freshness and lift. The wine of Chateau La Tour Haut Brion is best served with all types of classic meat dishes, veal, pork, beef, lamb, duck, game, roast chicken, roasted, braised and grilled dishes. The final vintage for this wine, before it was decided to blend in with the second wine of La Mission Haut Brion serves up a smoke filled, tannic, slightly rustic wine with tobacco, forest and black cherry aromas. Give it at least 5-10 more years to soften and develop. Better on the nose, with its smoky, cherry pipe tobacco and forest floor scents, than on the black cherry and leafy palate. Full bodied, tannic and on the masculine side fo the style range, with 2 hours in the decanter and some effort, wet earth, tobacco, cedar chest and tobacco notes begin to emerge. Still young, perhaps 5 more years in the bottle should allow the wine to soften and develop its aromatics. Tannic, rustic, medium bodied and better on the nose than the palate, there is not much fruit left in this wine. I'd opt for drinking this sooner than later. Tannic, youthful, austere, full bodied, strict style of wine, with a beguiling nose of tobacco, cigar store, burning wood and red berries. Concentrated and tannic, this is classic in every sense of the word. Another decade might help soften things out, but that is a very long to wait for this to come around. Great, complex, smoky, tobacco, cigar box, campfire and dark red fruit nose. Powerful and concentrated on the palate, but the wine is on the stern, rustic, unforgiving side. A very good example of old school claret with a lot of tobacco, cedar, smoke and cigar box notes on the nose. Big, powerful and a bit too tannic for its own good. There is a strong, gruff character to the tannins and a strictness found here, that is going to be a turn on to folks thinking the best wines in Bordeaux were made before 1961. There is no hurry to drink it, it is always going to retain its character, even as the wine evolves. Cedar wood, mint, tobacco, smoke, burnt wood, blackberry, cassis and tar create the nose. Big, tannic, full bodied and powerful, the wine packs an old school, beefy character filled with a wallop of cassis, green pepper and cherry griotte. This is the finest example of 82 La Tour Haut Brion I’ve ever tasted. Other bottles have not shown as well. Still on the young side, this classic style of Bordeaux is tannic, powerful, concentrated and firm, with complex aromatics and depth. This is good now and will get even better with time. Masculine, powerful, tannic and structured, the fruit is quality, the structure is there for further aging, but this is not a delicate, elegant or refined wine that you can sip easily, it requires thought and concentration, plus an appreciation for the type of Bordeaux wine made 30, 40 or 50 years ago. Served double blind, this bottle looked and tasted much older than it should have. Cassis, blackberry, cedar and earthy scents revealed a wine that was soft, polished and round in texture. This bottle was prematurely aged as other, recent examples displayed more tannin along with a stronger expression of its traditional, rustic personality. I have had much better examples of this classic, Pessac Leognan wine. Smoke, leather, tar, hot bricks, tobacco, eucalypts, blackberry, cassis and spice scents produce an intriguing perfume. Make no bones about it, this is an old school, rustic, masculine style of wine. It's powerful, steely, slightly austere, full bodied and still has tannin to resolve. For lovers of old school Bordeaux that could be how wine from the 20's, 30's and 40's were made, this is for you. I have a few bottles in my cellar that in the name of science, I'm waiting at least another 10-20 years to open. This beefy, powerful rustic, old school style of Graves is not made any more. Powerful, concentrated and intense, the wine is packed with smoke, spice, cedar, tobacco, cassis and tannin. Brawny, potent and packed with layers of chewy Cabernet Sauvignon, this is still tannic and requires a few more years. However, it's always going to retain it's old school style. The final vintage of La Tour Haut Brion was 2006. The wine is now part of the second wine for La Mission Haut Brion. Cassis, tar, scorched earth and herbal aromas are easy to discern. This is a powerful, brawny, forceful, extremely tannic, rustic, masculine style of wine that needs another decade to round out. This wine, or was it the bottle, seemed like it was from the 90’s. This dark, powerful wine was stuffed with cigar box, tar, leather, tobacco, cassis and truffle notes. Dense and concentrated with a slightly brawny personality, this potent brew finished with a long sensation of smoky black fruit and spicy dark berries. Robust, rustic, charming and classic, this was a treat to have in my glass. The wine has presence, depth, complexity, concentration and length. It was amazing to find this much power as it inches its way past its 65th birthday.